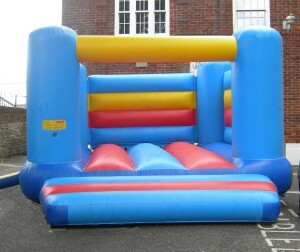 4.8m x 4.2m bouncy castle with sides. Mains powered, or can be powered with a generator of 3KVA or more, as long as the blower is the only thing running from the generator. Please note that you will need at least two strong people to collect, set up, pack down and return the Bouncy Castle. Resource Centre staff are not able to help with moving this equipment. None of our equipment is insured. You can get public liability insurance for your event for £16 upwards, from www.leisureinsure.co.uk. Their details are on our Insurance Suppliers page. If you already have insurance with another company, it is probably worth also contacting them. You will need the following information: The Bouncy Castle is 4.8m x 4.2m x 2.8m. It was purchased in January 2010 for £1740 and does have a ‘Pipa inspection certificate’. Bouncer on trolley: W: 122cm, D: 33cm, H: 132cm Blower: W: 51cm, D: 36cm, H: 46cm Please note that both the bouncy castle and the blower are EXTREMELY heavy. You will need at least two people to collect the bouncy castle. 13amp mains power supply or earthed generator of 3KVA or more. A large car or van with at least 2 strong people to transport it. Resource Centre staff are not able to help with moving this equipment from our store room to your vehicle.